How a Rinnai Tankless Water Heater Works? You’ve probably come across this article because you’re shopping around for replacement water heaters. We guess you’ve got 1001 questions about Rinnai tankless water heater, their reputation, and most importantly – their products. Well, you can stop looking because you’ve just found the most comprehensive guide to Rinnai tankless water heater reviews on the entire internet. Today we are going to discuss what we like (and what we don’t like) about the best Rinnai tankless water heater on the market. Below we are going to reviews of Rinnai tankless water heater that we know to be reliable and excellent value for money. We are going to list them in order of price (starting with the most expensive). 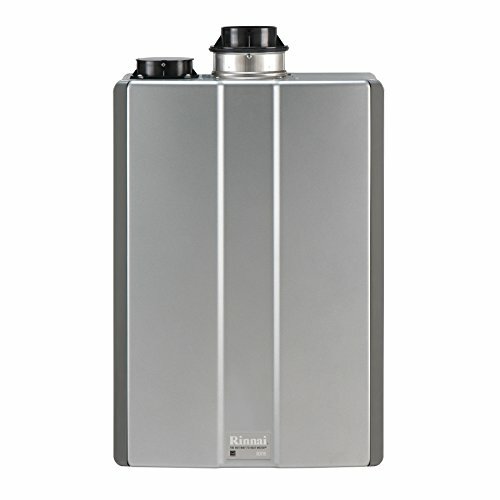 RUR98i is one of the biggest and the best tankless water heaters that Rinnai produce. It represents the cutting edge of modern water heater technology. This is a highly efficient product that runs on natural gas (and has an amazing GPM rate). Innovative technology provides an endless supply of hot water. Recirculation capability, with or without a dedicated recirculation line Innovative technology provides an endless supply of hot water. Rinnai’s condensing technology features dual heat exchangers to provide maximum efficiency, up to .96 Energy Factor. The most obvious thing to like about this water heater is the massive GPM rating it provides its owner. Its 9.8 GPM is one the highest on this list (and is one of the highest in the world). This is a heater that is more than capable of heating a large family home where you’re likely to be running multiple hot water hungry devices at the same time. However, this is not a normal water heater. Normally the 9.8 GPM would be a show-stopping feature, but the big thing you should be excited about here is the products recirculation feature. We won’t go into the technical details and bore you here, but basically, it means you can have an endless supply of nearly instant hot water instead of having to wait for it to circulate your pipes. The .96 efficiency factor (96% efficient) is also something worth shouting about. This is about as efficient as residential water heaters can get. When you consider how much water this thing is going to be heating on a daily basis, a super high-efficiency rating like this is an almost essential part of the package. The most obvious issue with this heater is the price of the unit. It’s a big product that has taken a huge amount of time, money and resources to design and build. As such, it’s not exactly what you would call “cheap”. But apart from the pricing, there is not much to dislike about this product. It’s a top of the cutting-edge range example of the excellence of Rinnai’s engineers and the company’s extensive experience. This is the easiest recommendation for us on this list. As we mentioned, it’s one of the best tankless water heaters Rinnai (or anyone else) produce. The recirculation feature is literally game changing and is a prime example of the kind of innovation that Rinnai is known for. Recirculation is one of those things that you’ll never be able to live without once you have it. An endless supply of nearly instant hot water that increases efficiency and reduces water wastage is a beautiful thing to have in your day to day life. Despite this, it’s far from what we would deem to be an essential feature, but if you want the best – this is it. Sure it’s not cheap, but this is a premium product that has a premium price tag. You get what you pay for when it comes to tankless water heater, and considering the specifications and functionality this unit provides. It’s a great value for money. The RUC98iN is the second most expensive water heater on our list. It’s very similar to the RUR98iN we just discussed above, but it’s around $500 cheaper. If you are in the market for something this size and liked the sound of the RUR98iN, you should certainly consider the RUC98iN too. Again like the RUR98in, this product has a fantastic 9.8 GPM rating that’s going to be able to provide any hot water hungry home with all the water it needs. It’s quite difficult to overstate just how much water 9.8 GPM is. You’d really have to try and use it all by turning every tap, shower, and machine on in the house before you started to notice a temperature drop. Again it’s got the same energy efficiency rating as the RUR98iN too. It’s .96 efficiency factor (96% efficient) is one of the best on this list, this going to help you keep your energy bills down really. The most significant “con” this heater has is that it doesn’t have the recirculation feature of the RUR98iN we mentioned above. As we mentioned earlier recirculation is a great addition to any tankless water heater, and if you have it in your home, it’s not going to be something you regret. But that being said, you can most certainly live without it if you don’t think it’s worth the extra money. This is a tankless water heater that Rinnai has produced to give consumers a choice. It’s pretty much the exact same as the RUR98iN just without the recirculation technology. We’re reluctant to recommend one or the other here. Some people will find the $500 or so price increase for recirculation technology good value for money, and others will find it an unnecessary expense. However, compared to other tankless water heater on the market this product is an absolute bargain. It’s pretty much got the best specs money can buy (without going to extreme prices). Again this is not exactly a cheap product. But for long-term investments (like water heaters) it usually pays off, in the long run, to get a quality item that you’re sure will do the job properly and stand the test of time. Now before we get into this review, it’s important to remember that the RL75iN is a much cheaper product than both the other products above. As such you have to adjust your expectations accordingly. For the price of the unit, this is a great little heater. The best thing about RL75iN is the huge 7.4 GPM that it can provide. We know that this might sound a little underwhelming after hearing about the 9.6 GPM of the two heaters above. But trust us, 7.4 GPM is more than enough for most family homes, the two heaters above are almost freaks of nature in the water heater world (and should not be used as a benchmark). 7.4 GPM will be a little easier to use up than 9.6 GPM, but it’s still more than enough to satisfy a large family. You could probably use three showers and a washing machine at the same time without noticing a significant temperature drop. Any more than that and you’ll probably begin to notice a decrease. The most significant con of this heater compared to the two above is the energy efficiency rating. The RL75iN has a .82 rating (82% efficient). Compare this to the 96% efficiency rating of the other Rinnai tankless water heaters on this reviews, and it’s quite a stark difference. Those percentages seem a little bit abstract, so let’s put it in real-world money terms here. You are going to be paying 14% more for your water if you buy the RL75iN instead of the RUC98iN. That’s not an insignificant difference. Considering the high GPM of this unit, it’s a great deal. There are not many other products on the market at this price point that can provide this much water (but there are some). We are slightly disappointed by the efficiency rating, and it’s an essential factor that Rinnai has slightly dropped the ball on here. In all honesty, we highly recommend that you consider spending the extra $500 or so and get the RUC98iN instead of the RL75iN. $500 is not an insignificant price increase we know, but it’s a sound investment over the long run. With this product, you’ll be paying 14% more on your energy bills for the next 10 to 15 years. That is almost certainly going to add up to more than $500 (and you’ll get more capacity out of the RUC98iN too). But if you really can’t afford the extra $500, the RL75iN is a fine tankless water heater that will stand the test of time and is great value (considering the price point compared to the competition). This is a great heater. We usually prefer natural gas, but if propane is what you need – then this is a product that is more than worthy of your consideration. Its GPM is lower than both products above, and it’s much less efficient – but it’s much cheaper. MC-91-1US Digital Controller with Error Code Indicator. Heavy duty forged brass Webstone Isolator service valves. The 9.4 GPM that is provided by this heater is an amazing amount of capacity considering the price of this unit. We can’t think of many other propane based heaters from other brands that can provide this kind of performance at this price point. It’s a little less capacity than both the top of the range RUC98iN and the RUR98iN we talked about above, but to be totally honest it’s an almost negligible difference of 0.2 GPM. The biggest issue we have with the RL94iP is the efficiency rating it has. We were a little surprised to find out that it’s been rated at .84 (84% efficient). This is reasonably good for a propane water heater, and it’s even better than the RL75iN natural gas tankless water heater. However, we cannot in good conscience sit here and tell you that a .84 efficiency rating is good. This product is a little tricky for us to recommend fully, but it’s more than worthy of your consideration. If you absolutely have to have a propane powered water heater, you could do a lot worse than the RL94iP. The main thing you need to take into account here is the efficiency rating. Water heaters are a long-term investment, and the efficiency rating directly effects how much you are going to be spending on your energy bills. And as hot water is one of the biggest consumers of energy in the home, it’s going to really add up over time. But as far as propane water heaters go, it’s not too bad at all. The final water heater we are looking at today is the only outside heater on our list. It’s a well built sturdy machine that is packed full of technology to provide your home with ample amounts of hot water at a very reasonable price. The best bit about this heater quite honestly is the price. It’s the cheapest product on this list at around $700 and is great value for money. However, as the most affordable product, it’s also the lowest rated in terms of GPM. The 6.6 GPM that the V65EP has is significantly lower than almost every other heater on this list. So why are we listing it as a pro instead of a con? Well, it’s because that you’re not going to be able to find a product that has this kind of GPM and this build quality anywhere else at this price point. For the price, 6.6 GPM is great value for money when you consider this is a Rinnai product. Sure you can find other 6.6 GPM heaters on eBay for a hundred dollars or so cheaper. But they will be a no name Chinese brand that will be incomparable to a Rinnai product in terms of quality. To be honest, we could almost have listed the efficiency rating of the V65EP as a pro considering the price point, but it could be improved a little. The V65EP has a .82 efficiency rating (82% efficient), which for a propane heater is not too bad at all. If we were picky it would be nice to see that rating a little higher (in the .84 – .85 range) but all in all – not too shabby at all. There’s not that much to really say about this product. It is what it is. It’s a mid-range product that is verging on being a budget model due to its low price. The efficiency rating isn’t great, but it isn’t terrible either. The GPM is decent enough for a mid-sized family home, and you can rest assured that it’s a reliable product (because Rinnai makes it). There are better water heaters on this list (in fact all of them are better). But considering how much you are paying for the V65EP it’s an absolute bargain. There is not much on the market from other brands that can compete with this level of quality and performance at around $700. Important Note: Natural gas is inherently more efficient than propane as an energy source. It’s unfair to compare the energy efficiency of natural gas and propane tankless water heater regarding product quality. The difference mainly comes from the fuel and not the product. What fuel types does my Rinnai Tankless Water Heater require? These units need propane gas or natural gas and they have an electric ignition system. Keep in mind that the electricity is simply used to spark the system into operation. The electricity doesn’t actually heat up your water. What electric power is required to start up Rinnai Tankless Water Heater systems? Although Rinnai units do not heat water through electric sources, they do require electricity to start the heating process using gas. The typical system requires at least 120 volts AC, lower than 3 amps, at 60Hz. 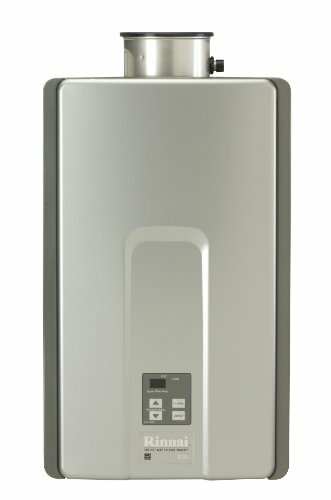 Are there any electric tankless water heaters produced by Rinnai? Unfortunately, no. Rinnai do not currently offer an electric tankless water heater system. There are two reasons for this. 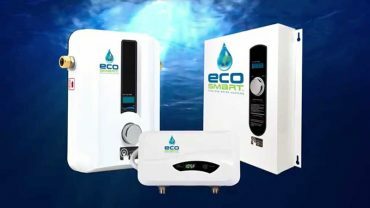 First, the electricity requirements of a tankless water heating system that can provide enough hot water for an average American home is sky high. Take the case of a unit delivering 3 gallons per minute with an average temperature of 80 degrees Fahrenheit. Such a setup needs a 150 amp, 230 VAC electric circuit. This system actually needs 8 times the electrical power used up by a central AC system weighing in at 3 tons. That’s a huge electrical footprint, which can cost you a tremendous amount of money to install. Second, even if you are able to afford installing a purely electric tankless water heating system, your maintenance costs in terms of your monthly electricity bill are going to be so much higher than your natural gas expenses. Based solely on average US electricity costs, your electric tankless water heating system will cost about 100% more than natural gas units. Even if you use more expensive propane gas, this is still much cheaper compared to a purely electric system. What is the expected life cycle of the typical Rinnai Tankless Water Heater unit? Generally speaking, Rinnai tankless water heater systems can continue to perform for up to 20 years or more. Of course, the actual life cycle of your specific product depends on many different variables. It can depend on the quality of the water you’re using to pump through your system. It also depends on how often you use it. You also have to factor in how harsh environmental conditions are outside your home. Finally, you also have to take note of how regularly the unit was maintained. Do Rinnai Tankless Water Heater systems require some sort of minimum water flow to properly operate? In terms of bare minimum requirements, Rinnai Tankless Water Heater systems need water flow in excess of 0.6 gallons per minute. This is the bare minimum required in the hot side of the system so the unit properly ignites and keeps water warm. It needs some level of flow to properly ignite its heating system so it can do its job. If the water flow goes below this level, the unit shuts down. Basically, it concludes that hot water is not really needed because the water flow is simply not there. If you are suffering from very minimal water flow rate problems, you can do the following to address the issue. First, you can reduce the temperature of your tankless water heater system to something more comfortable so that the cold water coming in doesn’t have to rise up to a high volume. Next, you can clean your input system so that the water inlet will not be constricted by sediment buildup. If you allow sediment to build up, this constricts the water flow and reduces your overall flow levels. Third, you should look into removing and cleaning or even replacing shower head aerators or other fixtures that reduce water flow. If any of the solutions do not work to increase your system’s water flow, get in touch with the plumber or installer who originally put your tankless water heater system in place. What is the size of the gas line required by the typical Rinnai Tankless Water Heater system? You will need an MNPT gas connection type. However, even if you have MNPT, this doesn’t mean that this is the optimal size for your gas line. The incoming gas supply should be customized to handle all of the total requirements of the hot water requiring appliances in your particular location. Keep in mind that the Rinnai Tankless Water Heater system will use up to 199,000 BTU for each heater installed at your location. Make sure you can handle the additional cost of this much gas. When properly sizing the gas line, make sure that a person with a proper state certification and proper training and experience performs the work. Can you convert your Rinnai Tankless Water Heater to another gas-type water heating system? The manufacturer offers a field conversion program that enables unit owners to switch to propane from natural gas or the other way around. This switching capability is actually available for almost all Rinnai tankless water heater models. 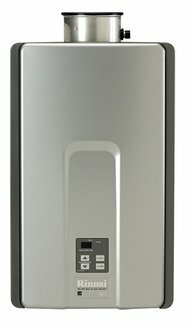 Can I use Rinnai external tankless water heater in very cold climates? Absolutely. The Rinnai units are specially designed to protect against freezing. In fact, they can keep water flowing even if it reaches -30 degrees Fahrenheit outside. You’re not going to worry about frozen pipes because this unit protects you from that possibility. It’s very important, however, that you have gas and power available for this unit. The water pipes that lead to your tankless water heater device must be properly insulated and heat traced. These are required for maximum freeze protection. The manufacturer Rinnai also strongly suggests to unit owners that they install a drain down device if you’re going to put your Rinnai external tankless water heater outside your home. This is an option, but this goes a long way in protecting your system from freezing up. If you have this system installed, it will drain out all the water that has accumulated within the system. So this way, if there is some sort of electricity or gas outage, or even if there is a broken part within your system, all water would drain out. Check your unit’s owner’s manual to learn more about this optional draining system. Can you heat your spa or pool with Rinnai Tankless Water Heater? Unfortunately, these units cannot be used to heat up spas or pools. The chemicals used to keep the pools and spas’ water hygienic and safe can harm the internal lining of this unit. These chemicals can be quite harsh. Accordingly, Rinnai Tankless Water Heater systems cannot be used with spas and pools. Are these units certified by Underwriters Laboratories or UL? While Rinnai Tankless water heaters do not have UL certification, they are, however, certified according to ANSI standards. Also, internal parts of these devices do carry UL certification. These are the conduit and wire units, its relay system, and its transformer. The UL ratings are as follows: Wiring, UL 1430; Relay Unit, UL 41515; and Transformer, UL 1411. Do I need a standing pilot for my Rinnai Tankless Water Heater? No, you don’t. These units have an electronic spark ignition system. Accordingly, they’re safer because there’s no active flame involved. What kind of maintenance will a typical Rinnai Tankless Water Heater need? 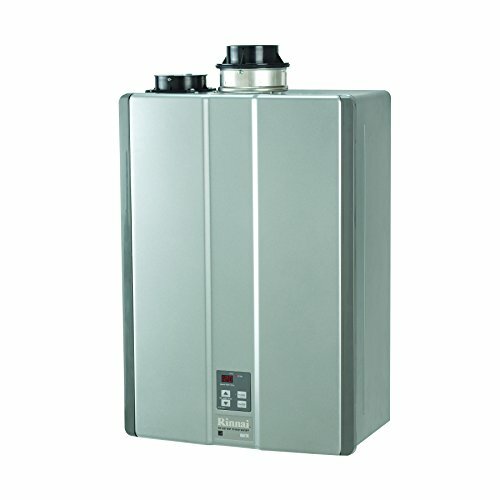 Tankless water heater systems produced by Rinnai require only two types of periodic maintenance. Either you or a trained service technician can do these. These are required to ensure that your unit continues to run smoothly. First, the screen filter of the line should be monitored from to time for debris. Now, this is not automatic. You have to factor in the quality of your water. If you are getting heavy water or mineral-rich water, you probably would need to check the filter more frequently. If you get relatively clean water, then you can get away with very infrequent checking. To do this, make sure that the water input is turned off. Your water supply has to be completely off so you can check the filter. This item is located below the cabinet in the inlet fixture of the tankless water heater system. Unscrew the system’s plug to remove the filter. This can get a little messy because some excess water will drain off. The filter looks like a cylinder screen. The second maintenance task that you need to perform is to flush the entire unit from time to time. Again, flushing regularity depends on how clean your water supply is. You need to completely flush out the system so as to minimize the buildup of lime and scale. What is the cold water sandwich effect? When somebody says “cold water sandwich effect,” they’re referring to a situation where a supply of cold water is introduced to a hot water supply line in a very rapid fashion. It’s as if you’re turning on and off a switch in a rapid sequence using a water heater. This happens when the temperature of the water coming out of the faucet becomes really cold in between really hot temperatures. Usually, people experience this effect when they’re taking a shower or running their hands through a faucet or feeling the water coming out of a faucet in a tub. It’s almost instantaneous. You are just enjoying your hot shower and then all of a sudden, there’s this blast of cold water. Talk about a rude and unpleasant shock. Thankfully, if you are using Rinnai Water Heaters, you’re rarely going to experience this. How come? Rinnai water heater units have built in systems that seek to minimize or even prevent the cold water sandwich effect. Unlike other products, Rinnai water heaters have microprocessors that regulate the flow of water through the system. This means that even if the water flow stops, the heating coils are still maintained to remain at a very high temperature for at least one minute. This way, when water starts to resume, instead of you getting blasted with really cold water, the heated coils heat up the water sufficienty so you don’t get that rude shock. What does temperature rise mean? The typical tankless water heater system produced by Rinnai has a maximum water flow rate that depends on how fast the temperature rises. “Temperature rise” measures the difference between the preset temperature of the water heater unit and how hot the water flowing through it is. For example, if you have manually set your water heater to 120 degrees Fahrenheit, but the water coming from outside is around 60 degrees Fahrenheit, this means that your system needs to achieve a 60-degree temperature rise. To minimize temperature rise issues, you just need to lower your set temperature. Alternatively, you need to ensure that the water coming in from the outside pipes is of a higher temperature. It’s crucial to minimize this difference because the hot water flowing out of your tankless water heater system increases in volume the smaller this gap. The bigger the gap, the less hot water will flow. This doesn’t mean that the system is broken. It just means that if you have a serious temperature rise issue, you really can’t expect your system to produce a very high level of hot water flow. That’s just not going to happen.